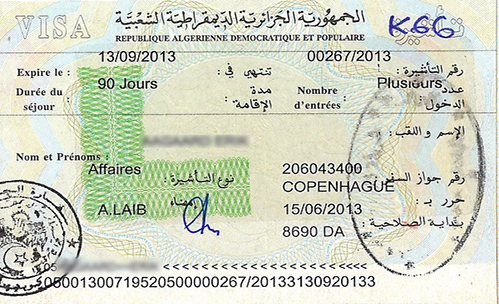 All Danish citizens must obtain a visa prior to their entry to Algeria. We at Alt Rejser are ready to help you secure a visa to Algeria. The Algerian consulate requires that applications must be submitted to the consulate minimum two weeks before entry date to Algeria. Fully completed and signed visa application. Original passport with min. 2 blank/empty pages. The passport must be valid for min. 6 months besides the validity period of the visa. Colored passport photo. You can have your passport photo taken at Alt Rejser (150 kr). Do you need a travel insurance? You can acquire electronically via Europæiske Rejseforsikring here. An invitation from your business partner in Algeria (must be in French and must be written in the company's offical letter head, with company stamp and signature of the authorize person. A gurantee letter from you or your company, where in you have to state the purpose of your travel, contact details, entry and departure date, as well as the name of cities you have to visit in Algeria. Company introduction letter, where in the company profile and activites in Algeria are described. Copy of your yellow health card. In order to get a visa to Algeria, it is necessary that you apply, 2 weeks prior to your entry date to the country, or else the application will be denied by the consulate. Kindly send all the documents to Alt Rejser together with a følgebrev, or personally submit it in our office. Note: If your case is urgent, we recommend that you send the documents to us, as a “Quick Letter” or as a registered mail. In this case the post must be handed over to the post office and we must be able to receive it the following day. If you send it as a regular post, it will take up to 7 days (or more) before we recieve the case. The prices include all the embassy fee and are applicable for Danish citizens only. All prices include Danish tax (moms). We will send your passport with the corresponding visa, when your visa is ready. You can have your passport photo taken at Alt Rejser (150 kr).